This category of landforms is divided into those which have been ice-moulded and those that have not. Ice-moulded landforms are significant because they provide information about the direction and velocity of glacier flow. Three broad families of ice-moulded subglacial landforms (bedforms) have been identified on the basis of size (Figure 9.15). Although each may be genetically distinct, these are as follows. 1. Flutes. Typically these are low (< 3 m), narrow (< 3 m), regularly spaced ridges which are usually less than 100 m long and are aligned parallel to the direction of ice flow (Figure 7.8B). They have a uniform cross-section and usually start from either: (i) a large boulder; (ii) a collection of boulders; or (iii) a bedrock obstacle. They are typically composed of lodgement till, although they may also contain fluvial sands and gravels. Clusters of boulders may occur within the body of the flute. They are a common landform in front of many glaciers today. are taller (< 5 m), broader and longer (> 100 m) and are distinguished from drumlins by having a length to width ratio in excess of 50. Their long axis is parallel to the direction of basal ice flow and they typically have a uniform cross-section. Occasionally they may start from a large bedrock obstacle, but most do not. Rogen (ribbed) moraines have a variety of morphological forms but generally consist of ridges formed transverse to flow, although sometimes they show reshaping parallel to ice flow. 3. Megascale glacial lineations (MSGL). 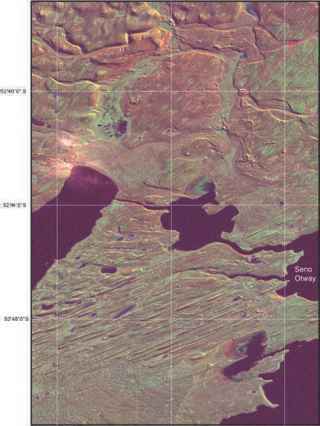 In recent years, much larger (megascale) lineations composed of glacial sediment have been recognised on satellite images. They are typically between 8 and 70 km long and between 200 and 1300 m wide, with 300-5000 m spacing between lineations. On the ground their morphology is often difficult to detect. Chapter 12). 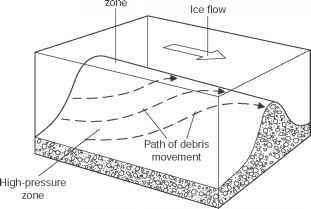 In a hypothetical ice sheet, ice will flow from the ice divide to the margin and this pattern will be recorded by subglacial bedforms. 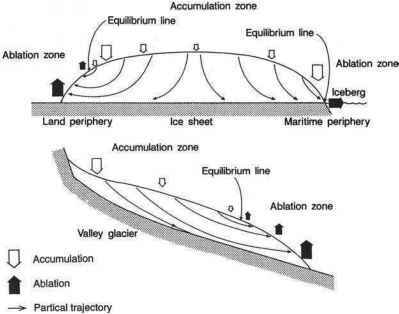 Within this ice sheet most geomorphological activity will occur where the ice velocity is greatest, close to the equilibrium line (Figure 3.15), and will decrease beneath the ice divide. If the location of the ice divide changes, then the pattern of ice flow within the ice sheet would be reorganised and a new set or population of bedforms will begin to form parallel to the new pattern of ice flow. These would alter or be superimposed on the original set of bedforms (Figure 9.18). Beneath the new ice divide little modification would occur due to low glacier velocity. However, beneath the equilibrium line the old set of bedforms would be quickly eroded and replaced by a new set with an orientation consistent with the new flow pattern. In between these two locations two populations of bedforms coexist in a superimposed or cross-cutting fashion (Figure 9.18). 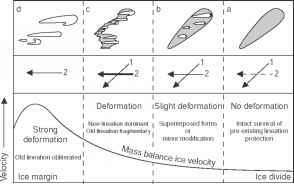 Cross-cutting bedforms therefore hold important information about changing patterns of ice flow. 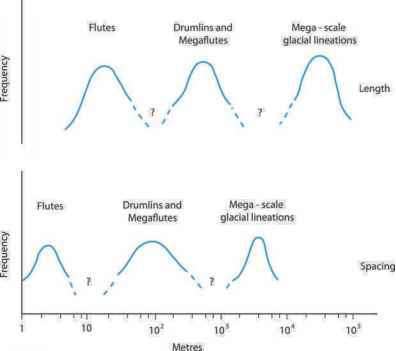 Figure 9.19 The formation of a glacial flute. the low-pressure area extends in front of the sediment ridge. Recent observations suggest that subglacial meltwater flow within the cavity may accentuate the morphology of the flute by eroding sediment along its flanks. Although this model is widely accepted, not all flutes have boulders or bedrock obstacles at their up-ice ends. There are two possible explanations: (i) the boulder was there and has been subsequently removed by ice flow; or (ii) there was never a boulder at the head of the flute and an alternative explanation for the formation of these flutes is required, perhaps in the same way that megaflutes and drumlins form. In contrast to the formation of flutes there is little consensus about the formation of drumlins, megaflutes and ribbed moraines. The range and diversity of these landforms is so great, particularly in the context of their internal composition, that some researchers have suggested that there may not be a single mechanism responsible for their formation. This concept is known as equifinality: different processes form the same morphological products. The acceptance of such an idea should, however, be consequent only upon our failure to find a universal theory. A general model for the formation of drumlins, megaflutes, MSGL and ribbed moraines must be able to explain the following factors. 1. Variables in the theory must be able to account for the different subspecies of subglacial landforms: drumlins, megaflutes, MSGL and ribbed moraines. 2. It must account for the different composition and structure of drumlins, mega-flutes, MSGL and ribbed moraines. In particular it must explain the presence of the three main types of drumlin core commonly found: (i) bedrock; (ii) till; and (iii) bedded sands and gravels. 3. 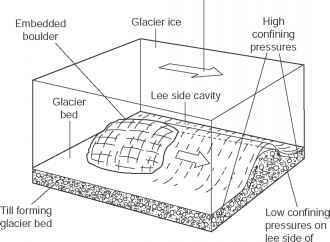 It must account for the spatial distribution of bedforms: why do they only occur beneath certain parts of an ice sheet? 4. It must account for the rapid rates of landform creation observed at modern glacier margins. 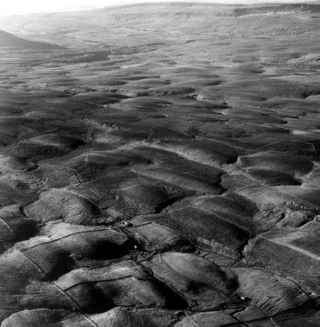 Most attention has focused on explaining the formation of drumlins. Numerous models, hypotheses and explanations exist but most attention is now focused on the role of subglacial deformation as the most likely explanation. It is important to note, however, that this is not the only idea currently proposed within the literature. In particular the possibility that glacial bedforms are produced by subglacial floods has been a persistent idea over the past decade (Box 9.5), although many consider this to be an 'outrageous' rather than plausible hypothesis. Observations of subglacial deformation beneath Brei9amerkurokull in Iceland were used in the late 1980s by Geoffrey Boulton and Richard Hindmarsh to develop a flow law with which to describe the deformation of subglacial till. Although this flow law has been widely disputed and amended since its publication, it forms the basis for several models of drumlin formation. The basic concepts of this theory are reviewed below, but it is important to note that it remains simply one of many models (Box 9.6). What sre the subglacial landforms formed by ice? What is a flute glacial bedform? Do flutes and drumlins form the same way?